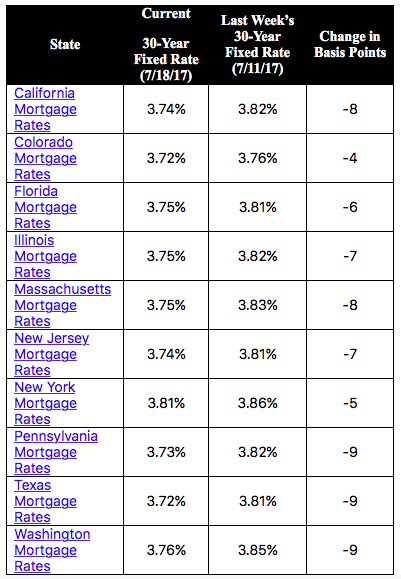 Current rates for 30-year fixed mortgages by state. The 30-year fixed mortgage rate on Zillow Mortgages is currently 3.75 percent, down eight basis points from this time last week. The 30-year fixed mortgage rate fell early in the week, then hovered around 3.76 percent for most of the week before settling at the current rate. The rate for a 15-year fixed home loan is currently 2.99 percent, and the rate for a 5-1 adjustable-rate mortgage (ARM) is also 2.99 percent.